The problem with airports located far from the city is the high cost associated traveling to it, especially when there is no efficient and economical public transport to get there. In other cases, the cheaper available option is still considered to be quite expensive to local standards – see the stark contrast between Malaysia and Singapore when it comes to the ticket for a one-way train ride from the airport to the city: Malaysia’s KLIA Ekspres costs RM35.00 (USD9.90) while Singapore’s MRT costs a fraction at SGD2.20 (USD1.75). Based on my travel experiences and nerd-like calculations, here are three money-saving tips in getting yourself to KLIA. Malaysia is blessed with an abundance of highways connecting Kuala Lumpur to KLIA in no time but they are tolled so driving to the airport would involve paying up to the man. After a diligent study of Google Maps, I’ve found a toll-free back road that covers about the same distance as the next best tolled route. Using KLCC as a starting point, using the highways would cost you up to RM6.80 in tolls (MEX – RM2.50 and ELITE – RM4.30) in quick succession while the cheaper alternative would only set you back by RM1.30 using the BESRAYA highway and the Putrajaya – Cyberjaya – Dengkil back road for a total savings of RM5.50. Bear in mind that this is a trunk road so expect traffic lights along the way and heavy flow of traffic during peak hours. I know the savings are not much but that’s actually enough for a decent meal to “repay” your driver. There are times when taking a cab is an absolute must. You don’t have anyone to send you to the airport and you have huge luggage to carry around or you’re traveling with your family and they prefer a bit of comfort than hopping on trains. The recent taxi app boom has helped us get better cab service and more transparent fares through the likes of GrabTaxi, EasyTaxi and UberX. With these apps, you can have a better grip at the door-to-door rates compared to the standard radio taxi while UberX charges you RM90.00 flat rate to get to the airport. Every now and then, these companies would throw in a seasonal promo where you pay a bargain fare to take a cab using their app to KLIA. Last year, MyTeksi offered RM30.00 for a one way trip instead of the usual RM65.00 – 85.00 rate. So, always get connected with these apps because a bit of brand loyalty would give you great savings when you most need it. Be on the lookout for promotions by taxi apps. From 9 May 2016, GrabCar is offering a RM65 flat rate to and from KLIA and KLIA 2. Find out more by clicking here. This is a open secret not many people are aware of – I only got to know about this through my friend who lives in Putrajaya who uses this “hidden” method when going to the airport. Putrajaya Sentral is a transport hub that services both the cities of Putrajaya and Cyberjaya, acting as a halfway point between KLIA and KL Sentral. It offers the best overnight parking rates (RM4.00 per day) and the KLIA Transit has the most reasonable rail ticket prices along the KL Sentral – KLIA route (RM12.40 return per person). Sure, the fuel and toll costs to drive to Putrajaya Sentral are not factored in but I consider that to be of minimal impact. As a matter of showing how cheap this method is, here’s a cost comparison for 4 people doing a return travel between KLCC and KLIA for a 3-day holiday. 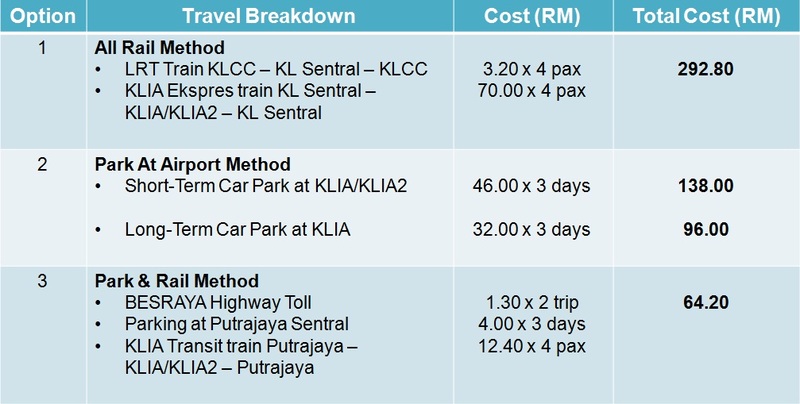 Three different methods to get to KLIA or KLIA2 with the Park & Rail Method being the cheapest. Express Rail Link Sdn Bhd, the operator of the train, has recently announced a fare hike effective 1 January 2016 for both the KLIA Ekspres and KLIA Transit. Tickets from Putrajaya Sentral to KLIA/KLIA2 now costs RM9.40 one-way (an increase of RM3.20) with special discounts on offer. You can check the new fares for KLIA Ekspres here and KLIA Transit here. Effective January 2015, the parking rate at Putrajaya Sentral has been revised. The day rate is kept at RM2.00 while the night rate is increased to RM4.00 so the overnight parking charges amount to RM6.00 a day as compared to RM4.00 a day previously. My friend pointed out that there’s an even cheaper way to get to KLIA2 through the integrated transportation hub (TBS) at Bandar Tasik Selatan. A return LRT train trip costs RM6.60 while parking is really cheap at RM3.00 per entry. The KLIA Transit train runs through this terminal but a return ticket would set you back about RM53.00. The more affordable alternative is to take the RM10.00 JetBus that runs hourly between TBS and KLIA2. So far, this option is best for travelers who are on a tight budget and have time to kill since you have to plan ahead and board the bus at predetermined times. As a side note, if you’re heading back home from KLIA2 and absolutely must take a cab, do read my fellow blogger’s low-down on Taking a taxi from KLIA2 so you have an informed decision on the best type of taxi to take that suits your budget. Do you have a cheaper way that you use to get to KLIA or KLIA2? How do you save money when traveling to your airport? Share it with me on the comments box below. Excellent tips! One point, you need to highlight the taxi system, especially after midnight or you can link to my post for easier reference. Thanks! I’ll link it to your post on the taxi system since you pretty much did a comprehensive take on it. Hey, this is actually quite useful!! I never knew about Putrajaya Sentral. Just wanted to say thanks for the great article. Very useful and well written. Especially appreciated the part about uberx rm90 flat rate to the airport as I couldn’t find that figure elsewhere. Thanks for reading through my article. I got the UberX pricing for a ride to the airport from their website & they might change it from time to time. This is a great read with some great tips, especially now the ERL has gone up to RM55 for a one way ticket! Also most of the bus co’s such as Aerobus and Skybus run a service from places like 1utama but it can take a few hours. I’ll be updating the new ERL prices soon but even after the hike, the best option is still to park at Putrajaya Sentral then take the KLIA Transit to the airport. Nice! Thanks for this. When we do have time, we normally go for #4. It’s certainly the most economical but a bit of a hassle if you bring along big luggage. You can also split your KLIA Transit journey, e.g. KL Sentral – Putrajaya; Putrajaya – KLIA/KLIA2, and save some money. Takes about 1 hour though to complete the whole journey this way so a direct bus ride might appeal more compared to this option. I’d take that option if I have time to spare & would want the comfort of taking the train than a more crammed bus. Huge luggage? I am thankful to ONLY travel with carry ons! I have to admit, travelers who only bring their carry-ons save a lot of money. parking rates at tbs now is charge by hourly rate. maximum per day is rm10. Sighhhh… however, u can park at Bandar Tasik Selatan LRT station parking (5mins walk to TBS). Here is charge hourly rate but maximum rm4/day. But im not confident about safety of your car. Park at salak tiggi erl multi-storey parking for rm3 per day. Take the free sepang-klia-klia2 bus. How would you rate the car safety of the option “PARK AT PUTRAJAYA SENTRAL & TAKE THE TRAIN” if need to park for 4 night? Hi Dushyant, thanks for dropping by! It’s safe as long as you take all the necessary precautions – stow away all valuable belongings from plain sight and add a lock if you have one. These tips are so important and practical! Well done!